I'm sure most are familiar with the parable of the blind men and the elephant. Several men investigate an elephant, but each touches a different part, so one describes it as being like a snake (the trunk), and others as a wall (the body), a rope (the tail), a fan (the ear), or a tree (the leg). 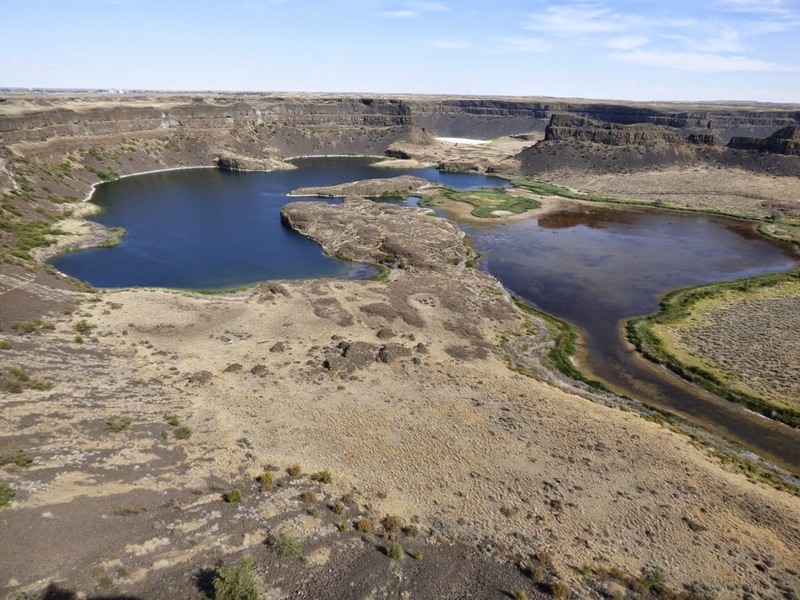 The story of the Spokane Floods and Channeled Scablands of Washington is pretty much the Blind Men and the Elephant as told by a Geologist. In this retelling, the geologist is just as blind as the others, but hearing the arguments among the others, decides to investigate further. He goes back, touches the trunk, the body, the tail, the leg, and ear, mulls on it for awhile, goes back to the arguing men and says "You aren't gonna believe this guys...". J Harlan Bretz was a Seattle-area high school science teacher in the early 1900s, and after receiving his doctorate in 1913 he became a professor at the University of Washington and later at the University of Chicago. He was interested in glacial features of the Puget Sound, but eventually started to explore the strange landscapes of the Columbia Plateau east of the Cascades. The plateau was volcanic (horizontal basalt flows), but it was covered by a fertile silty sediment called the Palouse Soil. The soils have been used for growing vast amounts of wheat over the years. But the soils weren't everywhere. 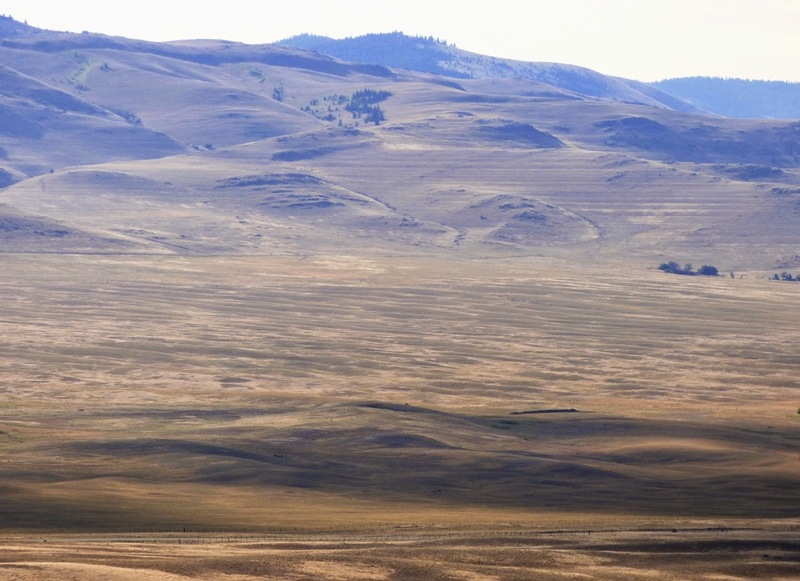 In many places they had been stripped away, leaving barren rugged channels across the prairie. Most of the channels could not be directly related to modern rivers, but geologists used the Pleistocene ice ages as an explanation. The vast ice sheets covered and changed the landscape, and river drainages would have been altered. The outwash from the melting glaciers could account for the apparently high volumes of river flow required to form the channels. But to Bretz, these facts weren't adding up. As topographic maps were finally becoming available for the region, he was starting to see the bigger picture of where these channels were found. He was, as it were, becoming a bit less blind. A startling hypothesis was beginning to form in his mind, an idea that would eventually transform our perception of one of the central underlying assumptions of geology. Geology made a giant leap forward in the early 1800s when James Hutton first articulated the principle of uniformitarianism, the idea that we can use our understanding of present-day processes to interpret what has happened on the Earth in the past. The idea that things happened according to the laws of nature in the past as they do today was a powerful model for understanding how rocks and structures came to be. As the science developed over the next century, the principle hardened into a sort of orthodoxy that all geological processes were constant, and generally slow. This was in part a response to the idea of catastrophism, a model that suggested that some geologic phenomena could be explained by unusual and violent events. To many geologists this smacked of religious explanations like global floods. The more Bretz explored the region, the more he was convinced that something extraordinary had happened here. 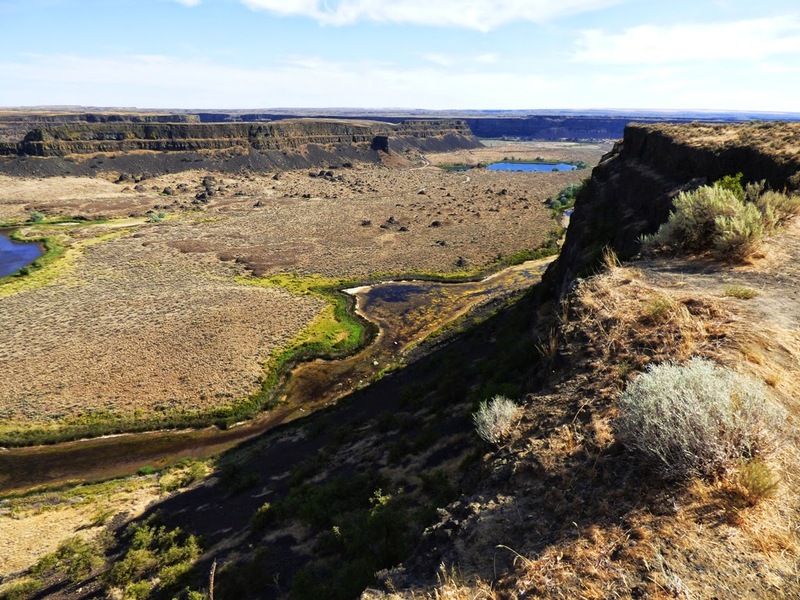 He documented the braided pattern of the dry watercourses, eventually referring to the rugged landscape as the "Channeled Scablands". He discovered gigantic ripplemarks in some of the channels. His research led him to suggest that a series of huge floods had affected the region, floods without precedent in the modern day. His hypothesis seemed to run counter to the principle of uniformitarianism and his proposal met with fierce opposition in the geological community. Among the weaknesses of his proposal was the source. Where had so much water (an estimated 500 cubic miles) come from? Bretz didn't have a good answer. At first. 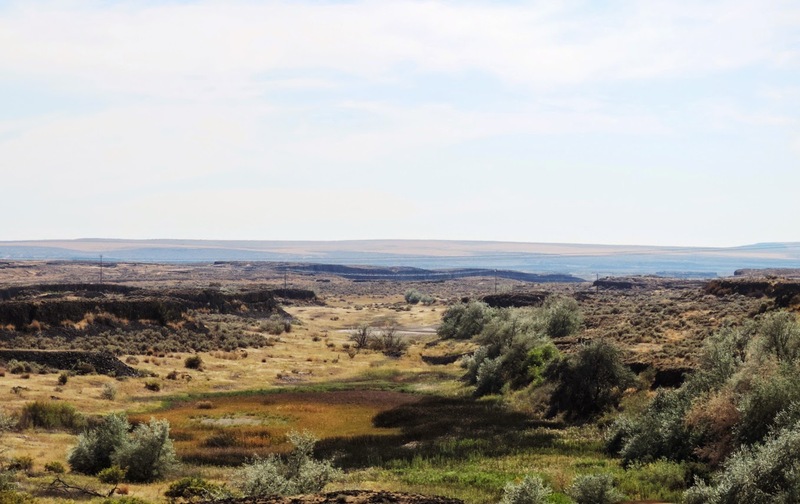 There were really two "blind" geologists looking at the Scablands problem. At the same time that Bretz was working on the Columbia Plateau, J.T. 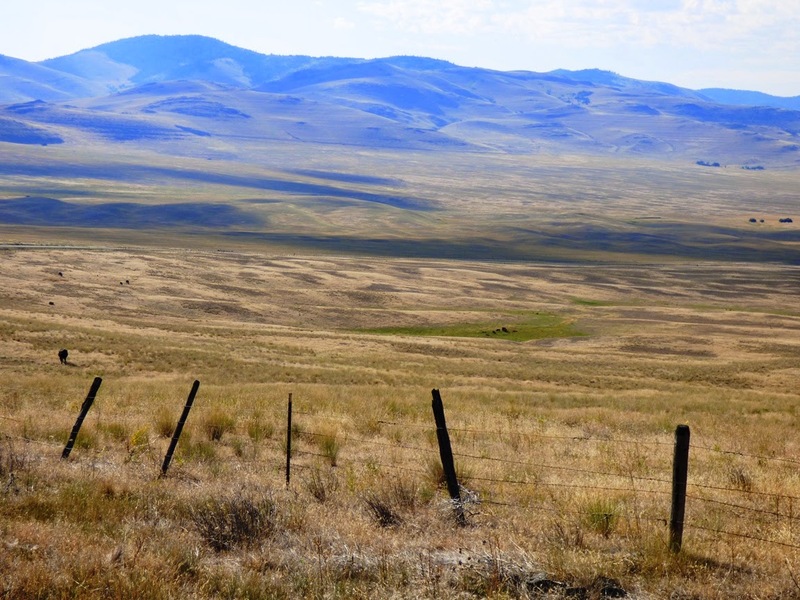 Pardee of the U.S. Geologic Survey was documenting evidence for a huge ice age lake that flooded canyons and plains in western Montana. It is said that he leaned over during a conference in the 1920s where geologists were eviscerating Bretz's hypothesis, and told his colleague "I know where the water came from". It was a number of years before the two put their ideas together as a comprehensive model, and it took even longer before the hypothesis gained widespread acceptance in the geological community. Our understanding of uniformitarianism had to change first. There was actually no logical reason to insist that geological rates were constant, slow, and unchanging. The current understanding of the principle is that the natural laws that govern any phenomena are the constant. If it looked like a river had transported boulders, then if channels existed with much larger boulders, then a much larger river was required, even if no such river exists in the present day. If a "small" crater like Meteor Crater in Arizona was produced by a fifty-foot wide meteorite, then a 130 mile wide crater like the one in the Gulf of Mexico would be produced by a much larger rock, maybe ten miles wide. Such a collision with the Earth would surely be catastrophic, and the available evidence suggests strongly that this one destroyed the dinosaurs and many other species on the planet. Catastrophism can be an acceptable explanation if it doesn't disobey the laws of physics and chemistry. 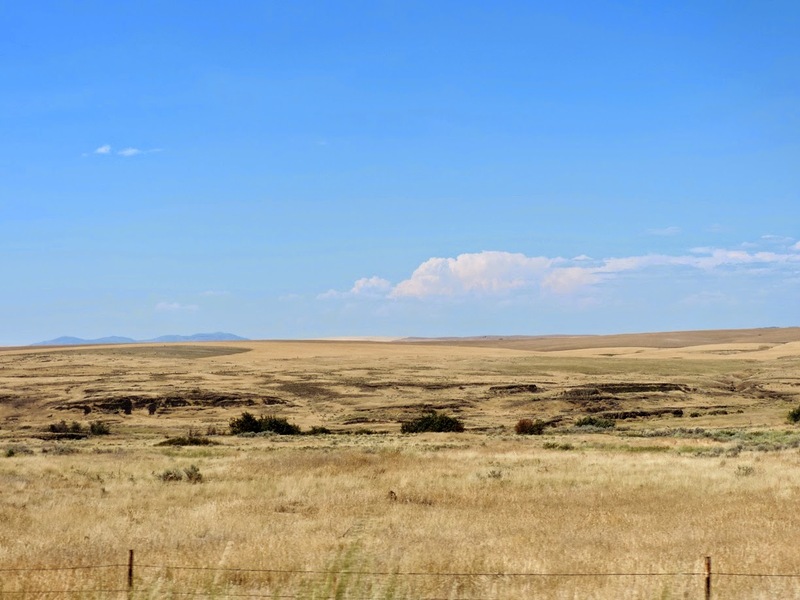 We were on the last stages of our exploration of Canada and the Pacific Northwest, making our way back to Seattle via the Camas Prairie in western Montana and across the Channeled Scablands in central Washington. Our first stop found us on the Camas Prairie at Markle Pass. 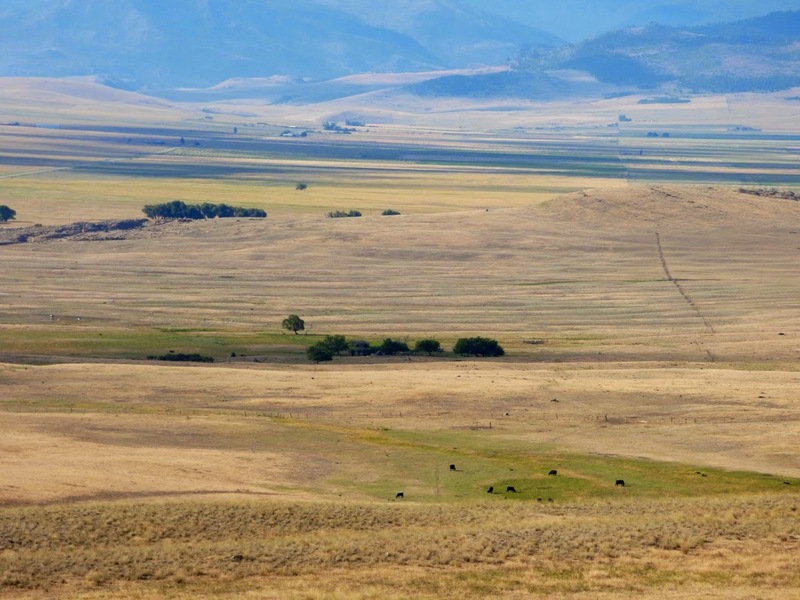 The Camas Prairie was one of the spots where J.T. Pardee was able to document the existence of glacial Lake Missoula. Not only were there shoreline terraces carved into hillsides (below), but ripplemarks covered the valley floor. These were no normal ripples. They were as much as 30 feet high with wavelengths of 200-300 feet. The hydraulics suggest that the lake was draining fast enough to produce currents of 45 mph on the valley floor. We left the Camas Prairie and drove west through canyons that had once contained a lake 2,000 feet deep. 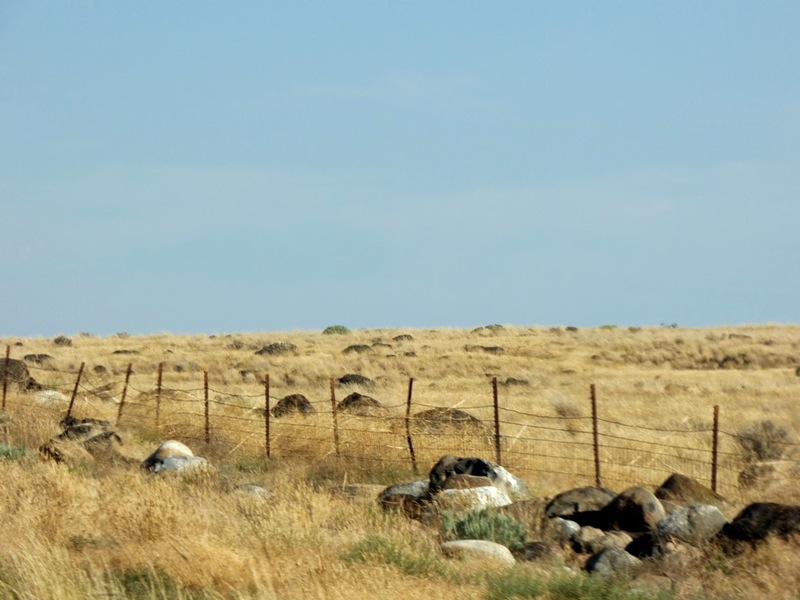 At Coeur d'Alene and Spokane we broke out into the plains of the Columbia Plateau, and our route passed through hills of Palouse Soil interspersed with jagged channels of basalt. In the afternoon we arrived at one of the most astounding results of the flood, the Dry Falls at Sun Lakes-Dry Falls State Park. The park preserves a 400 foot deep valley that was carved in a matter of days by the flood that was probably 300 feet deep at this point. The waterfall was 3.5 miles wide. It is one of the most astounding pieces of evidence for the gigantic floods. I can only imagine what the scene would have been like on one of those days 15,000 years ago. A day like any other except for the rising fog in the distance and the dull roar of the coming waters. What a sight it would have been. In the early years of his research, Bretz did not have the benefit of maps or aerial photographs. 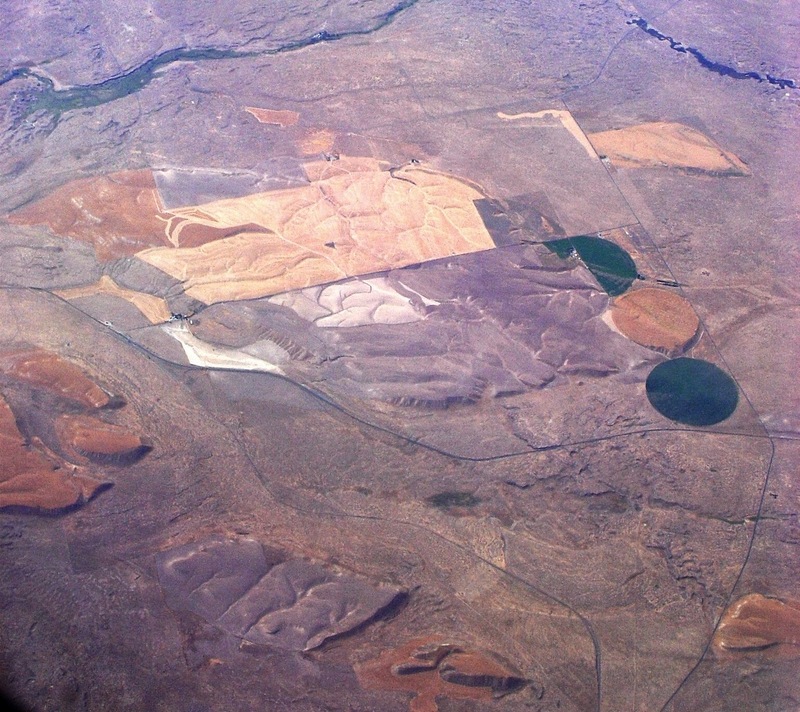 Today hundreds of thousands of airline passengers pass over the Scablands yearly, often without looking out the plane window. It's quite a sight when you realize what you are seeing. 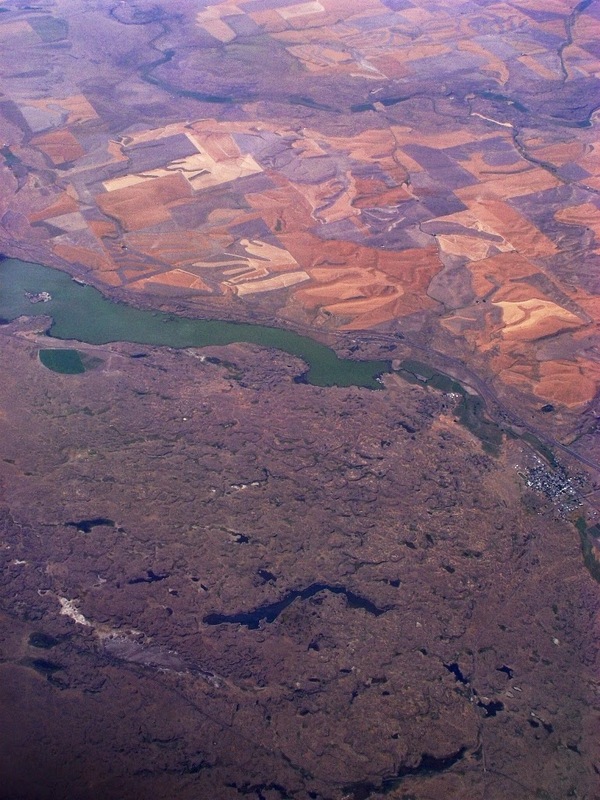 I took a couple of shots a few years ago.The Palouse Soils show clearly in the upper part of the photo, while the dark basalts of the Scablands dominate the lower part. Note the small village on the lower right for a sense of scale. Even the view from a plane fails to communicate the full size of the flood. Satellite images are the only ones that can reveal the true scale of one of the world's great catastrophic events. 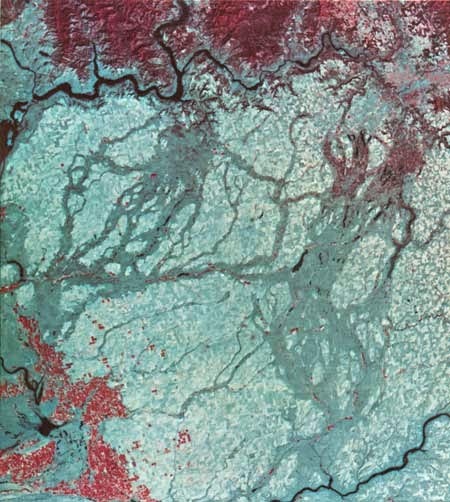 One can say that the flood seems obvious when seeing the satellite view, but Bretz and Pardee had only the ground perspective to work with, and their years of detailed research and careful documentation. They were the blind men touching the different parts of the giant elephant, but they had the insight and evidence to put the whole story together. Decades passed before their model was accepted by the geological community, but they did receive recognition in the end, and the science benefited from a new perspective on the principle of uniformitarianism. It is one of the great stories of geology. We pulled into our motel at Moses Lake for the final night of our Northern Convergence tour of Canada and the Pacific Northwest. We still had some incredible sights ahead on our last day on the road. I want to make that road trip someday-- could you post a map showing the roads you drove, and stops you made? I guess I'd like to make that request for many of your posts! Standing looking at Dry Falls my imagination saw a huge waterfall. It's a very interesting landscape for sure.